C.A.T Manager Online is a remote management tool that enables automatic usage-monitoring of gC.A.T4 fleets. Using a standard web browser, managers and supervisors can review how their entire team of field operators are using their C.AT locators. 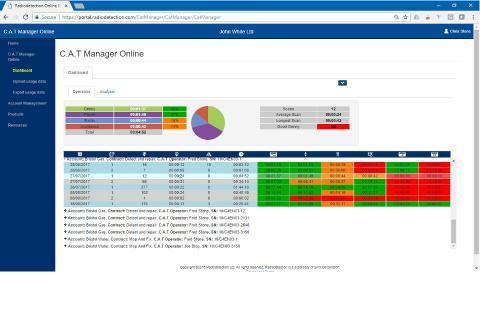 Enabling near real-time reports, C.A.T Manager Online can be used to check work quality before operators leave the site. The data can also be used to prevent poor work practices developing, by identifying training needs early. gC.A.T.4 GPS Cable Avoidance Tools connect with a free Android or Apple mobile app to transfer usage data to the remote server at the end of each scan. There is no need for operator intervention or complex manual data retrieval, saving time and effort for both field operators and office staff. The web interface provides a structured analysis and presentation of the data, allowing supervisors to easily assess work quality. Built-in GPS adds location information to all the scans, and surveys can also be visualised using the Google Maps interface. Try the system out today! Follow the Quick Start Up guide from the Literature section of the Radiodetection online support portal, available at support.radiodetection.com. Visit portal.radiodetection.com, set yourself up as a guest user and follow the instructions to set up a company.